If all the Coca-Cola ever produced were to erupt from the geyser Old Faithful in Yellowstone National Park at a rate of 15,000 gallons per hour, this geyser would flow continually for over 1,689 years. Recognizing the power of advertising, Woodruff took the Coca Cola Company from an American success story to an international powerhouse. Robert Winship Woodruff was an entrepreneur who made possible the success of the Coca-Cola Company. Born in Columbus, Georgia, in 1889, he worked as a truck salesman for the White Motor Company, based in Cleveland, Ohio, and quickly rose to the position of general sales manager. Three years earlier in Atlanta, Georgia, Dr. John Pemberton had invented a new carbonated soft drink flavored with malt syrup, dubbed Coca-Cola by his partner Frank M. Robinson. Sold for 5 cents a glass, "Coke" was first distributed in syrup form and sold only at soda fountains. When Pemberton died in 1888, Asa Candler purchased his secret formula and elevated Coca-Cola to a national brand. By 1895, just seven years after he bought the company, Coca-Cola was available in every U.S. state. Atlanta banker Ernest Woodruff, president of the Trust Company of Georgia, recognized the company's potential and persuaded his son to invest in the Coca-Cola Company. In 1923, Woodruff became president of the now publicly traded company. The new president put uncommon emphasis on product quality. Woodruff established a "Quality Drink" campaign, in which trained servicemen assisted fountain outlets in selling and serving Coca Cola. He saw vast potential for the bottling business and established quality standards for every phase of its operation. By 1929, Coca Cola sales in bottles had for the first time exceeded fountain sales. 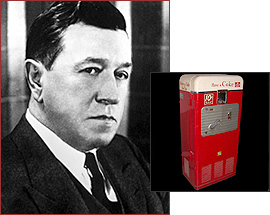 Woodruff introduced revolutionary merchandise concepts such as the six-bottle carton, which made it easier for consumers to take Coke home, and the metal, open-top cooler, which made it possible for Coca Cola to be served ice cold in retail outlets. While Candler had introduced Americans to Coke, Woodruff would spend his 60 years as company leader introducing it to the world. Coke was product no one needed; people had to be sold on it. Advertising was key, and Woodruff saw opportunities everywhere. In 1926, Mr. Woodruff established a foreign department, which in 1930 became the Coca Cola Export Corporation. Plants were opened in France, Guatemala, Honduras, Mexico, Belgium, Italy and South Africa. Woodruff captured these foreign markets with innovative campaigns, sending Coca-Cola with the U.S. team to the 1928 Amsterdam Olympics and emblazoning the company logo on racing dog sleds in Canada and the walls of Spanish bull fighting arenas. Following an urgent request from General Dwight Eisenhower's base in North Africa, Woodruff set up 64 bottling plants around the world to supply American troops during World War II. Many of these wartime plants were later converted to civilian use, permanently enlarging the bottling system and accelerating the growth of the company's worldwide business. Under Woodruff's direction, the Coca Cola Company became so successful that he was able to engage in a substantial degree of philanthropic work, donating money to health care, education, economic development, art and cultural activities, and environmental conservation. In 1937 he established the Trebor Foundation (his first name spelled backwards), which became the Robert W. Woodruff Foundation following his death in 1985. Until then, Woodruff remained at the helm of his Coca-Cola Company, which by then was an internationally known brand.